The evening will have a pot luck buffet and and NEW this year, a gift exchange. If you would like to participate in the exchange please bring a small wrapped gift (approximately $20 in value). All individuals can participate. Some non fishing gifts are appreciated for non fishing members or spouses. Note: Unfortunately this year we will not have a cooking demonstration from Fritz Sonnenschmit. He recently moved out of the area. We still expect to have a lot of fun. I hope to see you there. NOTE: Due to the Thanksgiving Holiday our November chapter meeting will move to Wednesday November 28th, instead of the 3rd Wednesday of the month. Hope you can make our September meeting this Wednesday. 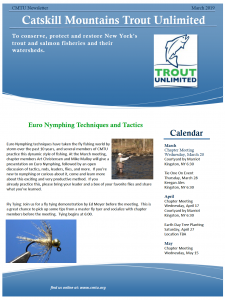 Our speaker this month is Morgan Lyle, author of Simple Flies: 52 Easy-to-Tie Patterns that Catch Fish. If you’re not familiar with Lyle’s work, you’re in for a real treat. I picked up a copy of Simple Flies at the Fly Fishing Show in Edson last winter and I’ve been reading it compulsively since. Morgan is currently writing a book on Tenkara. I can’t wait to hear what he has to say about that. Check out our September Newsletter for information about chapter events and updates on the situation at the Blue Hole, the Delaware River oil spill, and other conservation issues. Alexander Bradley of the Catskill Conservation Corps will be speaking to us about the CCC and the work it does in the Catskills, as well as opportunities for CMTU to partner with them on conservation projects. The Catskill Conservation Corps has done clean ups and trail maintenance all over the Catskills, including a lot of work keeping the Blue Hole clean. So come out to the meeting and learn about some of the conservation concerns in the Catskills and find out how CMTU can help. The Women’s Initiative will be meeting before the chapter meeting, from 5:45-6;30 in the Courtyard Marriott Cafe. All women members and friends of the chapter are welcome! Please read the April Newsletter! In collaboration with the Ashokan Watershed Stream Management Program (AWSMP) the Catskill Mountains Chapter of Trout Unlimited is organizing a tree planting project on Bush Kill, along Watson Hollow Road in West Shokan on Saturday, April 21, the day before Earth Day, from 9:30-2:00. Meet at the AWSMP at 9:30 for sign in. We’ll car-pool to the site, where there’s limited parking. CMTU and volunteers will be planting native trees and shrubs along Bush Kill in partnership with the Arbor Day Foundation. The goal of this project is to plant along critical coldwater streams in the Catskill Mountain Region. The planting will help stabilize the streambank along the creek to reduce erosion and provide shade to keep the water cold and clean!